The V-fit Fit Start rowing machine is an ideal machine for both fitness beginners and those who enjoy regular workouts. Perfect for use in the home, this machine features adjustable hydraulic resistance and an LCD exercise monitor to track your progress, while all the time promising comfort with the contoured padded seat. This equipment comes in the lower price range, ensuring that this easy to assemble rowing machine is easy on the pocket too. 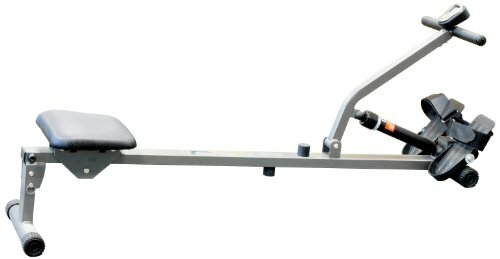 This rowing machine features 12 hydraulic resistance settings, ensuring that the equipment will remain challenging as your fitness levels improve. The battery powered LCD display shows a range of useful workout information, such as the stroke count, the time and the theoretical calorie burn, this info displayed on two rows. The high density padded handlebar row arm grips and the comfortable seat ensure your workout is high on comfort too. The large footplates with the Velcro style adjustable straps ensure your feet are secure, while also ensuring that movement feels natural at all times. In comparison to similar rowing machines, this is priced very reasonably due to the discount you’ll find at Amazon. The equipment is easy to assemble and can be used by anyone up to a maximum weight of 100kg or 220 pounds. On its side, this rower is just 14 inches high, making it ideal for storage too. Reviews of this item are mostly very positive. The assembly is said to be particularly easy, taking just 15 minutes, so you’ll be up and running (or rowing!) in no time. It has also been stated that the machine is particularly quiet, ideal for use in front of the TV or when listening to the radio, although perhaps more suited to the beginner than the more serious rower. The words ‘value for money’ appeared on more than one occasion. The V-Fit Fit Start rowing machine is an ideal one for those who want a regular comfortable and effective workout. Low in price, this machine will track your progress, while the multiple hydraulic resistance levels will push you fitness levels higher and higher. Check out the feedback from current owners and the latest discount on the amazon.co.uk product page.